Pamela Geller’s pro-Israel ad is bigoted and idiotic. And she has a clear First Amendment right to post it in the New York subway. Pamela Geller is an idiot and a bigot. And like all such, she has a clear First Amendment right to express her ideas in the New York subway. The title of this post more or less speaks for itself, I think. I wish the issue did as well. I have little doubt that Geller’s threat to sue the MTA will cause it to reverse its ban on the ad, as a similar threat by Geller did in the past.Â The MTA presumably knows its constitutional law by now, but has cynically calculated that it will gain PR benefits by initially denying Geller’s rights and appearing to grant them only later, reluctantly, and under threat of litigation. One of these days the geniuses who run the MTA may start to realize that denying Geller her rights, repeatedly, only helps a powerful racist spread her opinions and play the underdog. And yes, this means that Geller should enjoy the same First Amendment rights that she would deny to Muslims seeking to build a community center several blocks from Ground Zero. The right to free speech, as always, protects the self-aware and the hypocrite alike. Author Andrew SablPosted on September 27, 2011 September 27, 2011 Categories UncategorizedTags Civil liberty, Gotham City, Human rights31 Comments on Pamela Geller’s pro-Israel ad is bigoted and idiotic. And she has a clear First Amendment right to post it in the New York subway. Corrupt Murdoch empire: dog bites man. Corrupt cops: man bites dog. To my eye, the oddest feature of the hacking scandal now roiling UK politics is that all the attention focuses on Murdoch. But it’s no news that he’s a crook or that he runs a crooked enterprise. It is news – or at least it ought to be news – that the Metropolitan police were crooked, both in detail (at the level of individual officers illegally selling personal information on citizens) and in bulk (the cover-up that passed for an initial Scotland Yard inquiry: perhaps because of fears of disclosing police corruption?). Heads – more than just one head, I think – really need to roll. Not just resignations, either: some people ought to switch from police uniforms to prison stripes. Who, for example decided to hire the former News of the World executive editor (arrested today) as a “consultant” at Scotland Yard? The police, like the press, have an invaluable role in unearthing the wrongdoing of others. When they start to go bad – in this case, when they go bad together – the potential for social damage is extreme. How free should hate speech be? Should a homeowner annoyed about the lights of a neighboring mosque be allowed to post a sign in his yard saying “Bomb making next driveway?” I’d say no. A homeowner complains that the lights from a new building on an adjacent property shine into his house. He asks the neighbor to build a fence. The neighbor says that a fence would cost too much, and plants a hedge instead. The hedge will provide the required privacy once it is full grown, but not now. The homeowner, naturally, is annoyed. So he does what any sensible person would do. Since the uncooperative neighboring landowner is a mosque, he posts a sign. Seems to me this would make a nice law-school hypothetical. 1. Â Is the sign protected free speech? 2. Does it constitute incitement? 3. If so, is it subject to prior restraint? 4. Either way, is it actionably defamatory? 5. Does the homeowners’s assertion that the sign doesn’t actually specify the mosque by name have any weight? Seems to me that the people who use the mosque shouldn’t have to put up with being called terrorists, with the attendant risk that someone might try to do something about it. But I’d be interested in expert views on the law* [see update below], and in everyone’s views on the policy question. What’s shocking is not that the homeowner was annoyed enough to try this stunt; it’s that he thinks he can get away with it: not legally, but socially. If it had been a Catholic church, and the sign had said “Child molesting next driveway” I would have been concerned about violence against the homeowner rather than the church. And at the very least I would expect him to be shunned by everyone else in town. Is he right to think that the people who live in his Buffalo suburb won’t give him a hard time? I sure hope not. But he knows them better than I do. Seems to me pretty clearly constitutionally protected. The only possible basis for a lawsuit would be that the sign is libelous, but in context itâ€™s pretty clearly likely not to be seen as a statement of fact about what actually goes on in the mosque next door. Just to clarify the reason I assume that people wouldnâ€™t see that sign as a statement of fact about this particular mosque: If someone really thinks that a mosque made bombs, he probably wouldnâ€™t put up a sign to warn passersby, but would instead call the police. 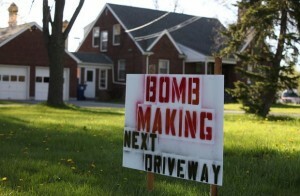 Bomb-making by a neighbor is just not the sort of thing people try to warn the public about. So even people who suspect that some mosques do harbor bomb-making on their very own grounds probably wouldnâ€™t interpret that sign as an allegation that this particular mosque does precisely that. Speech canâ€™t be punished on the theory that it advocates crime unless itâ€™s (1) intended to and (2) likely to produce (3) imminent criminal conduct, i.e., conduct in the immediate future and not at some unspecified time in the future. Another good reason to handle this socially rather than legally: the other neighbors ought to make it clear to the homeowner that he’s being a jerk, and ostracize him if he keeps it up. The good news and the bad news about that is that he’s not entitled to due process of law. Author Mark KleimanPosted on May 10, 2011 May 10, 2011 Categories UncategorizedTags Civil liberty, Terrorism and its control29 Comments on How free should hate speech be? A couple of my students approached me today with what they thought was a rather disturbing discussion in their first year Constitutional Law class (I teach Property to the same group). Virtually all of the students who commented defended the decision.Â It was only after several minutes that any student spoke up and set forth the obvious issues, i.e. 1) that US citizens were convicted of simply being present in their country of citizenship; and 2) that German-Americans and Italian-Americans were not similarly treated. I should quickly say that I don’tÂ question the professor in this case at all (and neither did the students I spoke with).Â He’s very good at raising open-ended questions and allowing the students to think (and speak) for themselves; no one would question his egalitarian and anti-racist bonafides. Well, perhaps this is one of those cases where everyone “knows” what the “right” answer is, viz., that Korematsu was an embarrassing abomination, so the students were attempting to argue against the obvious answer.Â I wasn’t in the room, so it’s hard for me to tell.Â But it doesn’t seem like this group: they don’t hesitate to speak up, but they won’t argue for the sake of arguing. The drip, drip, drip of anti-Muslim propaganda from the “respectable” organs of the Right and the constant MSM images of Muslim radicalism has made us more willing to understand or accept why decisionmakers would decide that for national security’s sake, perhaps one group has to be focused on.Â We might accept profiling, which of course is a far cry from internment, but really, it was more serious then, and in fact they had attacked us, and while I certainly don’t like this and would try to do something else and of course the vast majority of Muslim-Americans are loyal citizens you can’t be too sure and…. Perhaps the weapon is still sitting there. Tom Plate celebrates Lee Kuan Yew and Mahathir Mohamad. My friend Tom Plate, teacher and journalist, has just published two slender, fascinating books in a series he’s calling “Giants of Asia.” His first two “giants” are Lee Kuan Yew and Mahathir Mohamad. They have in common outsized personalities, rather astounding records of political stability and economic success under not-obviously-favorable circumstances … and complete, utter, total, ineradicable, and unconcealed contempt for anything resembling political freedom or personal liberty other than the freedom of the market. The most striking feature of the books is the author’s frank admiration for his subjects, an admiration that extends to their tyranny, which he does not deny but rather celebrates, as a form of government possibly superior to republicanism. I don’t care if Rand Paul’s been injured. I’ve been injured. I don’t care if Rand Paul has been hurt by Jack Conway’s ad. I’ve been hurt. Part of me regrets saying more about Jack Conway’s “Aqua Buddha” ad. ButÂ I have to, because what seems to be a huge majority of the Left Blogosphere has grossly, dangerously, missed the point. Jonathan submits that the ad criticizes Paul not for disbelieving religion but for mocking it. Jonathan is incredibly smart and this is the only gobsmackingly absurd argument I’ve ever heard him make.Â But the first time’s a doozy. Â Stipulating for argument the possibility that Conway would cut an ad on the theme “Paul’s atheism is just fine, but his irreverence is disqualifying,” this ad isn’t doing that.Â If you want proof, look at the repeated word in the upper left-hand corner: “Why?” That Paul’s college club mocked Christianity is not in dispute.Â The question “why” can be digging for only one implication: he mocked Christianityâ€”and praised Aqua Buddha and hates faith-based-initiativesâ€”because he’s a non-Christian. The mockery, the implication goes, could be a drunken college prankâ€”but it points towards what’s really sinister: the atheism. Defenders of the ad (who include, besides Jonathan, digby, Theda Skocpol, and Kos [see below]) say Paul and the Republicans have no cause for complaint because Paul is demonstrably using religion instrumentally and because scores of Republican ads are bigoted, false, or both. I actually agree.Â Let’s blaze away, and display very big cojones (or your favorite macho metaphor, since they seem to be mandatory on this one).Â Paul and Rove deserve everything they get. As an unbeliever in America, I’m used to being a religious minority and I’m not especially aggressive in that role. I don’t insult the religious; I don’t even expect politicians to defend the legitimacy of my beliefs (though it would be nice if they did; it might chip away at the clear majority of Americans who would never vote for a candidate who shared my beliefs or the near-majority who would never want me to marry their daughter).Â But I do insist that candidates who belong to my party and ask for my support not gratuitously reinforce bigotry against me, nor attempt to profit from it.Â Implying President Obama is a secret Muslim is despicable not because there’s anything wrong with being a Muslim but because the implication profits from the prevailing prejudice that it is wrong, holds greater force the more we can count on that prejudice’s being unshakable,Â and slathers an extra coat of implied respectability on the prejudice. And the same is true of implications that somebody is secretly and shamefully a Jew, a quarter Blackâ€”or an atheist. Personally, I see nothing wrong with it. Voters are less concerned with issues than values when casting their ballots, and for many voters, religion speaks to the candidate’s values. I may not like it, but it’s a democracy, and the notion that the source of a candidate’s values are off-limits is patently absurd. Sure, that means that as an atheist I would never get elected in Mississippi or Alabama or Kentucky, but so what? No one has a right to electoral office, and in a democracy, you have to sell yourself to the voters. In many places, religion is part of the package. If we crossed out “atheist” and wrote “Muslim,”Â nobodyâ€”least of all progressivesâ€”would doubt the cowardice and injustice of this surrender to bigotry.Â If we wrote “Jew” instead, we would wonder how somebody so self-hating could stand to show his face outside the shtetl. But when it comes to atheism, naked, shameless political prejudice directed against one’s beliefs is not to be denounced.Â It’s not to be shrugged off as regrettable but unavoidable. It’s not evenÂ to be quietly disapproved of but tolerated.Â It’s to be cheered on: hey, that’s the way to show guts and a sense of democracy. The projection involved hereâ€”and in the hundreds of tub-thumping comments that back Kos upâ€”is breathtaking.Â Disapproval of the ad is supposed to show that Democrats are wussy and don’t know how to fight back when punched?Â That’s a strange way to put it.Â Faced with a calculated, effective slander of his own group as unfit to share political office with real Americans, Kos hasn’t just said “thank you sir, may I have another.” He’s loudly called on every other atheist in the room to do likewise.Â Strategy is one name for that, but not the best name. Jack Conway has been praised for following “the Chicago Way,” for pulling a gun when the other guy pulls a knife.Â Again, fine.Â I’m not sorry for the guy with the knife.Â I’m sorry that to get to that guy Conway casually decided to mow down a few million innocent bystandersâ€”including me.Â And I wish that fellow progressives could see the blood. Author Andrew SablPosted on October 18, 2010 October 19, 2010 Categories UncategorizedTags Anti-atheist bigotry, Civil liberty, Politics and Leadership, Religion and Politics23 Comments on I don’t care if Rand Paul’s been injured. I’ve been injured. In my first month of college, I was in my dormitory grill waiting in line to buy a burger. An enormous lineman from the football team strolled in, cut directly to the front of the line and said â€œHey, free food!â€ and began grabbing the order of the person who was then paying at the register. I am not a small person, but this football player was as large relative to me as the biggest kid in 12th grade is to a pre-pubescent 9th grader in the same high school. I was afraid of him and said nothing to defend either everyone waiting in line or the person whose meal was being stolen. And then the guy next to me in line, a slightly built upperclassman, said, â€œStop cutting line, get in the back and wait your turn!â€ I tensed up immediately, expecting the lineman to throttle him or smash his face. Instead the far-from-gentle giant looked up, paused for a moment, and then meekly put down the food he had grabbed and walked away. When I heard these words a pane of glass shattered in my consciousness. I was suddenly freed of the unstated, unquestioned world view I had carried in my head all through adolescence: Bigger kids take what they want and hurt who they want and get away with it. Even though I was never personally bullied as a teenager, realizing that the brutal rules that applied only 4 months earlier were no longer in force was a palpable relief. Even that is too mild a turn of phrase. It was a joy, the joy of becoming an adult with basic rights and protections. Sadly, it is a joy that Sladjana Vidovic and three other bullied teens who have committed suicide at a single Ohio school will never know. American adults allow our nationâ€™s children to live under a set of rules that we would never tolerate for ourselves. If Sladjana had been an adult and been tormented as she was at school by co-workers or neighbors or strangers on the street, she would have had many routes of legal redress and active support from the adults around her. But because we do not give our young those protections, they drop out of school, or become depressed, or retreat into drugs and alcohol, or take their own lives. The only place we tolerate such a grossly unjust situation among adults is in prison, and thatâ€™s where our acceptance of bullying has effectively put countless children in this country. Dan Senor and the National Review want to stigmatize donors to the Ground Zero Muslim community center? Sign me up. …even as the mayor called for the mosque to be embraced, those opposed to the project pledged to aggressively fight it, using both litigation and public pressure. A prominent Republican and foreign policy analyst said he was working with business, civic and political leaders to organize a campaign to persuade architects, contractors and donors to steer clear of the project. He said they would also aggressively scrutinize any donors who supported it. Andrew Sprung, whence I get this, has the right idea: he’s donated to the community center, here.Â So have I.Â The Christianist Right, and their new friends the ADL, want to stigmatize everyone who believes in religious liberty?Â Let them find that they’ve isolated themselves, not us. Author Andrew SablPosted on August 5, 2010 Categories UncategorizedTags Civil liberty, Clash of Civilizations, Religion and Politics5 Comments on Scrutinize THIS. To right-wingers who say that the Arizona immigration law is necessary to protect “respect for the rule of law,” there is a simple two word answer: John Yoo. So just a few minutes ago I was having a conversation with a very conservative RepublicanÂ colleague about immigration and the Arizona law.Â I agree on virtually nothing with this colleague, but always like to hear his views.Â but then he said something that would have made me go ballistic if I hadn’t been able to control myself. To which there is a simple two-word answer: John Yoo. Seriously, the same people now talking about the rule of law, ran roughshod over decades of settled opinions concerning torture, concerning the separation of powers, concerning search and seizure, concerning, well, just about anything if it stood in their way, and they are now lecturing us on the rule of law? I realize that hypocrisy is the tribute that vice pays to virtue, but this tribute is a little too high — which makes it rancid. Sheriff Joe Arpaio likes to use his law enforcement powers to harass his critics. That’s a federal felony. Of course a magazine article isn’t evidence. Â But if the Criminal Section of the Civil Rights Division isn’t looking into charging Arpaio and his goons for conspiracy to violate civil rights (18 U.S.C. 241*) then someone isn’t doing his job. Â Unfortunately, this sort of behavior isn’t restricted to buffoons like Arpaio, but he’d be a good place to start. UpdateÂ Sure enough, the FBI seems to be looking in to Arapaio’s abuse of power.